The EUROCOM P7 Pro Se and P5 Pro SE Mobile Servers can now be ordered with VMware ESXi vSphere Hypervisor 6.0. The fully upgradeable and configurable 15.6” P5 Pro SE and 17.3” P7 Pro SE are powered by Intel Xeon E3 series processors, 32 GB memory, 6 TB of RAIDable storage, built in UPS, and support for a variety of server grade operating systems for the ultimate capability, mobility and deployment. The EUROCOM P5 Pro SE and P7 Pro Mobile Servers are the 5th generation of Eurocom Mobile Server powered by Intel Xeon processors, continuing the tradition of highly capable, stable, upgradeable and expandable server grade hardware from Eurocom. Take the EUROCOM P5 Pro SE or P7 Pro SE to disaster and emergency locales with nothing to worry about as heavy duty ABS plastic is used in the chassis to provide a very rugged, yet sleek case that is perfect for professionals on the go, who require a tough, all in one system. The EUROCOM P5 Pro SE and P7 Pro SE have Intel® XEON E3-1200 v3 series support from an Intel Z97 Express Chipset and LGA 1150 socket. Memory is fully upgradeable and configurable with four SODIMM sockets able to support up to 32 GB. 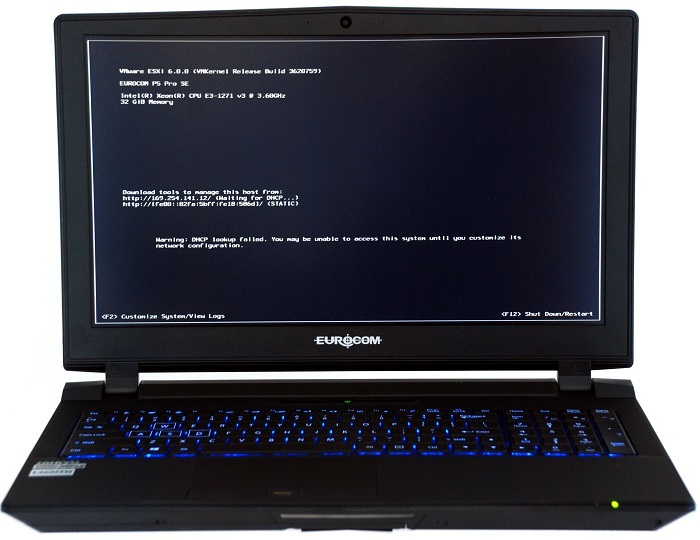 Storage for the EUROCOM P5 Pro SE and P7 Pro comes by way of four drive bays, two M.2. SSD slots and 2 standard drive bays for up to 5 TB of RAIDable storage. PCIe Solid State drives are supported for enhanced storage performance. RAID 0, 1, 5 and 10 options are offered for maximum performance or to protect your data. An 8 cells 82Wh Li-Ion internal battery pack is a crucial aspect of the Mobile Server concept, offering up to 120 minutes of backup battery power in case of electricity failure, allowing for safe and secure shutdown after power loss. The P5 Pro SE is prewired for 3G/4G module support, through an M.2 slot, so users can have a reliable internet connection on the go, in remote locations, with no need for messy cable internet connections. Security is paramount for Eurocom Mobile Server customers, we equipped them with a Trusted Platform Module 2.0 (TPM), finger print reader and Kensington lock port to keep crucial data and intellectual property secure. On top of the VMware options, Eurocom Mobile Server customers are also available to choose Microsoft Windows Server, Windows 10, and Windows 7. VMware vSphere ESXi 6 is the newest major release and comes with new and improved features as well as increased scalability. Increased hosting and cluster sizes are supported along with VM capability. Like everything from Eurocom the customer is in the driving seat as they can choose which meets their needs or requirements.